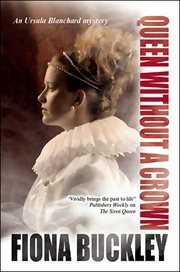 The item Queen without a crown, Fiona Buckley, (ebook) represents a specific, individual, material embodiment of a distinct intellectual or artistic creation found in Charlotte Mecklenburg Library. The ninth gripping murder mystery to feature Ursula Blanchard, special aide to Elizabeth I-November, 1569. Happily married to her third husband, Hugh Stannard, lady-in-waiting Ursula Blanchard is hoping to give up her undercover work for Queen Elizabeth l in order to enjoy domestic bliss. But when Hugh unwittingly endangers possession of his ancestral home, Ursula is forced to take on a seemingly hopeless-but handsomely paid-private assignment, which the Queen spots is the perfect cover for a covert investigation into a group of rebel barons plotting to put Mary, Queen of Scots on the English throne..